At least 60 people were killed and several others injured when two speeding trains mowed down people standing on the tracks near a railway crossing in Amritsar, said media reports. The victims were standing on the railway tracks watching celebrations for Dusshera, a Hindu festival, when a train hit them at high speed on Friday, reported the Indian Express. It is not clear who, if anyone, had given permission for the event and officials are trading blame, reported BBC. An inquiry into the incident has been ordered by the Punjab authorities, it stated. On Saturday scores of victims' families gathered at the tracks, criticising the state government and demanding action against the train's driver. The families protests came even as reports emerged that Congress leader and Cabinet Minister Navjot Singh Sidhu’s wife Navjot Kaur Sidhu was the chief guest at the Ravana effigy burning event. The locals claim she continued to give the speech as people were struck down by the train. Later, she left immediately without helping the people. The angry people who had gathered at the accident site raised slogans against the Cabinet Minister and his wife. Indian Prime Minister Narendra Modi described the incident as "heart-wrenching" and expressed his condolences. "Extremely saddened by the train accident in Amritsar. My deepest condolences to the families of those who lost their loved ones and I pray that the injured recover quickly. Have asked officials to provide immediate assistance that is required," he said in his twitter post. According to eyewitnesses, at one point, some of the crowd moved on to some railway tracks a short distance away, with some reports citing organisers' safety concerns about the effigy. Many on the tracks had been busy filming the festivities on their phones at the time so did not hear or see the train approaching at high speed, they stated. Meanwhile, officials have warned identification of all the victims could take several days. 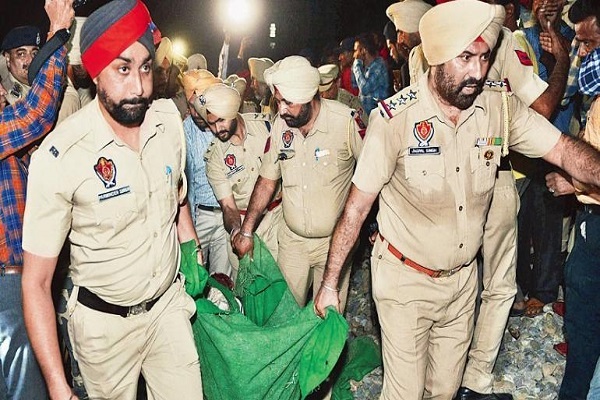 Ordering the inquiry, Punjab Chief Minister Amarinder Singh described the incident as "absolutely tragic". He said officials would do "everything possible" to assist the injured. "I've been seeing this event every Dusshera from here and this has never happened before, the railways should have stopped or slowed down the train," Deep Kumari, who was watching from her home, told Reuters news agency.